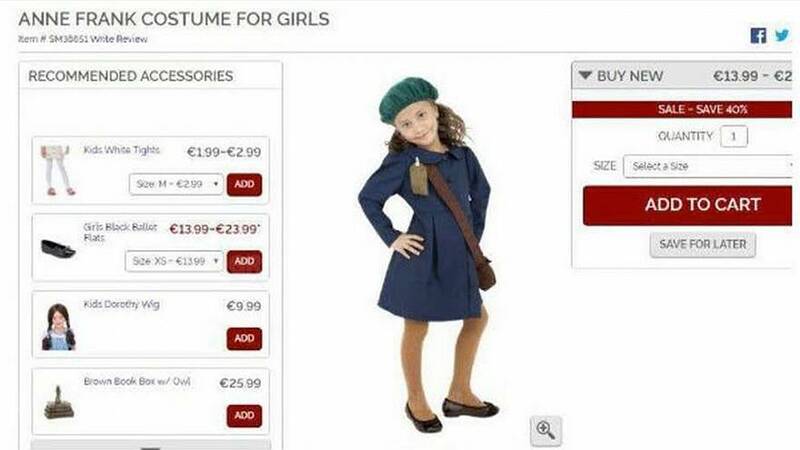 A children’s Halloween costume depicting Holocaust victim Anne Frank has been pulled from a retailer’s website following widespread condemnation. In online advertising, the costume was worn by a smiling child model, posing with a hand on her hip. Online retailer HalloweenCostumes.com removed the outfit from its website amid outcry from advocacy groups and individuals on social media. Jfc, imagine this needs to be said. Welcome to an America where the White House empowers anti-Semitism. In a Facebook post, the Anne Frank Center for Mutual Respect said it was pleased the company acted swiftly. Frank, aged 15, died of typhus in 1945 at a concentration camp in Germany. The Diary of Anne Frank, which she wrote while in hiding for two years with her family during the Nazi occupation of the Netherlands, has sold more than 30 million copies.